Being a game developer is not just about coding, creating art and late nights. One of the biggest challenges as an indie developer is figuring out the best way to get exposure and excitement for your game on shoestring budget. It takes a lot of risk, anxiety and the help of friends but can be done with stellar results. 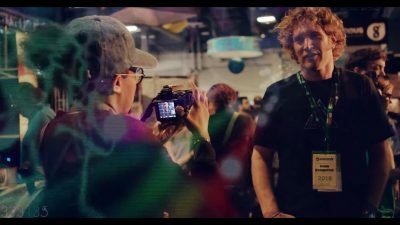 The documentary below follows the story that came from taking an extension on my credit card and buying a flight to Austin, Texas to get my game – Roto Color Runners – out from a bedroom in Australia to one of the biggest festivals in the world – South by South West (SXSW). The primary reason for choosing SXSW was the fact that the game is based around music and Austin is known as the “Live Music Capital of the World”. Rather than re-iterate what’s in the film, I’ll let you watch it and see the adventure it created. I hope you enjoy it and find useful things you can use in your own endeavours in game development. Of course, it could not have been done without the help of a lot of friends and wonderful people. From crashing on the lounge room floor, to lifts around town, equipment lending and helping on the stand, the success of such an event is the product of many factors not seen on the showroom floor. You all know who you are and I look forward to catching up with you all again sometime soon. And a massive shout out to Paul Grant of Eyelid Kid, who after showing him the game, was generous enough to provide an (at the time) unreleased track off his new album Hometown to use within the game. It became the showcase track and still gets huge smiles whenever it gets played in the game. The final thanks go to my brother Rhys Votano, who was responsible for the idea and execution of the entire documentary project. I hope this inspires other game developers to take the same kind of big risk themselves and take their games to some of the festivals around the world. While it may be a financial strain, who knows what amazing story will come from it. I hope this inspires other indie game developers to take the same kind of big risk themselves and take their games to some of the great gaming festivals around the world. While it may be a financial strain, the amazing story that will come from it will far outweigh the costs involved.